Poetry can make people swoon, and a shocking image can enrage people to action. But one of the lesser-known, but no less powerful, ways to invoke emotion is simple, everyday colours. The psychological effects of colours have been studied by scientists since the Middle Ages, but you only need to look at the world around you to see – and feel – their impact. Every colour elicits a different and unique emotional response in the viewer, and the clever web designer (and any visual professional in that regards) will know the effect of each colour, plus how and when to use each. While the discipline of colour theory is broad, this article will teach you the fundamentals in a single, quick-reference source. But before we delve into the emotional nuances of 12 separate colours (then explain a quick case study), but we need to first make a quick note about vibrancy. Simply put, a colour's vibrancy is how dark or light it is. The tricky part about vibrancy is that, just like each individual colour has its own properties, so does each shade of the same colour. While light green and dark green have more in common than green and purple, they will still have smaller, more subtly different effects on the user. Below, we'll explain all the noteworthy differences between a colour's shades, regarding their impact on web design. As a general rule, though, brighter shades tend to be more energetic, while darker shades more relaxing. The brighter shades of calls-to-action attract the eye, while the darker shades in backgrounds help create an immersive effect. Picking the right colour is not enough – you must also consider hue. Keep this in mind when reading about each colour below. As a dominating colour, red adds gravity and heightened awareness – quite literally, as the colour increases blood circulation, breathing rates, and metabolism. Red can take on a variety of meaning, associated with both love and war, but the unifying factor in all meanings is a sense of importance. Think of the red carpet. Red is a colour best used cautiously. Its knack for attracting attention makes it a priceless tool for designers, but excessively it will inhibit relaxation. Lighter shades emphasize the energetic aspects of red – including youthfulness – while darker shades emphasize power, and even durability, such as a brick wall. 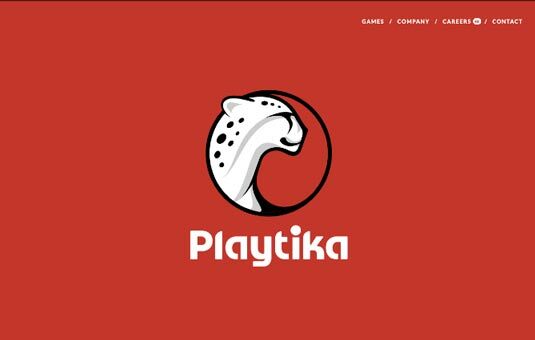 The landing page for the game design company Playtika has an aggressive but potent flair. Playful and stimulating, the red suits the cheetah logo, a powerful icon itself, softened by the cartoonish qualities and anthropomorphic smile. Sharing red's energizing aspects, but to a safer degree, orange is a good way to add excitement to a site without severity. It is generally playful, and some claim it creates haste and plays on impulse. It can even signify health, suggesting vitality and vibrance. 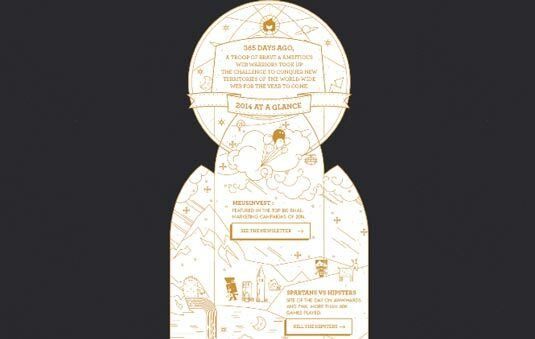 The interactive newsletter for the Epic Creative Agency is written and drawn in orange, emphasizing their playfulness and youthfulness and coinciding with the fun themes and content of the art. Yellow is a strange colour: it is often associated with happiness, but also activates the anxiety center of the brain. Like red and orange, it's able to stimulate and vitalize – it's the colour of warning signs and taxis – but use bright yellow sparingly because of the potential negative connotations. Lighter shades play on the happiness aspects, reminding users of summer and the sun. Darker shades, including gold, add more weight and give a sense of antiquity. 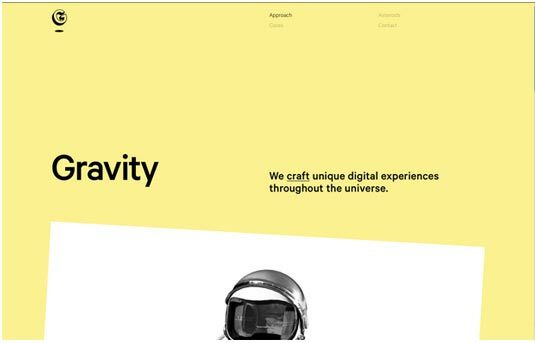 The yellow background in Lunar Gravity creates a light-hearted mood, accentuated by the quirky animations and playful scrolling effects. The anxious side effects of yellow are muted by the colour's softer tone, keeping all the good aspects without the bad. Green mostly represents the environment and outdoors, for obvious reasons, making it the clear choice to suggest nature and an organic quality. As the bridge between stimulating warm colours (red, orange, yellow) and calming cool colours (blue, purple), it is the most balanced of colours, lending it an air of stability. It's also a popular choice as an accent or for calls-to-action because it stands out, but more softly than the warmer colours. In Western Culture, it also represents money and financial safety. 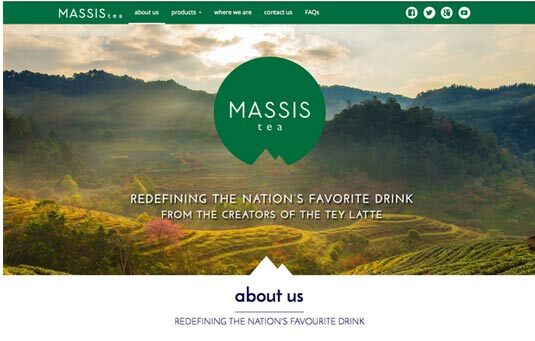 Massis Tea plays on its natural qualities with the green scheme for its site. The green top navigation bar, green logo, and photograph of greenery all work together to accents the brand's ties to nature. As we first described in Web Design for the Human Eye, blue is one of the most popular colours in web design – and for good reason. You see blue on a lot of websites because, to put it simply, it is the colour of trust. Blue is the colour of calm and serenity, and as such inspires security and a feeling of safety. For this reason, blue is a colour often used by banks: CitiBank, Chase, Capital One. However the calming effects also make blue a friendly and inviting colour, which explains its adoption by Facebook and Twitter. As if that weren't reason enough to use it, blue is also incredibly versatile; its vibrancy has more drastic effects than other colours. Light blue is the colour of water and the sky, so it generally has a refreshing and free feeling – even energizing if bright enough, but still retaining that reliable calm. Darker blues tend to be more somber, heightening the security aspects, which makes them an excellent choice for professionalism. All this comes at a small price, though: blue shouldn't be used for food-related sites. Because blue foods aren't common in the wild, studies show that the colour actually acts as an appetite suppressant. 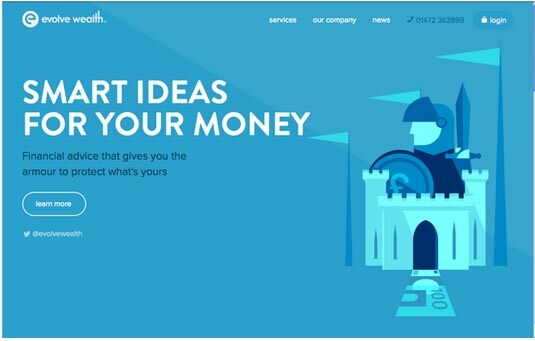 Trust is essential for financial advisors like Evolve Wealth, so most of their site is designed in varying hues of blue. Long associated with royalty, purple creates an air of luxury, even decadence. Using a purple dominantly is a quick way to create a sense of elegance or high-end appeal, even if your product is budget-minded (an “expensive” effect that's quite the opposite of orange). Lighter shades of purple bring to mind spring and romance, especially lavender. Darker shades of purple add more mystery, and can even symbolize creativity. Darkening the shade will also turn the romantic elements more sensual. 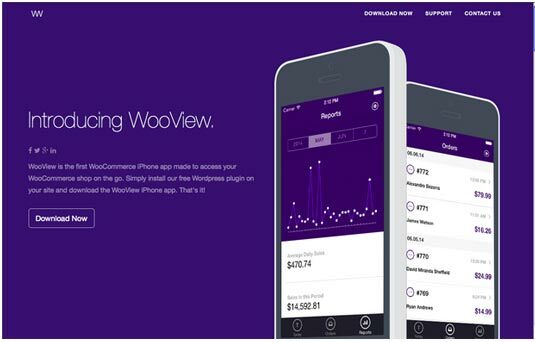 With its ties to personal wealth, WooCommerce chose purple as the colour to represent their WooView app, playing on themes like royalty and panache that fit the function of checking how much money you're making in real time. Pink is a specialized colour that won't work for a lot of sites, but will work perfectly with the right audience. Because most people interpret people as feminine, the colour is quite popular for targeting female users. The connotations with childhood and with sugary treats gives it a sweet, sometimes innocent appeal (not surprisingly a self-perpetuating cycle). It is also traditionally used with love and romantic themes, alongside red and light purple. However, don't overdo the pink-femininity connection, or else you're walking a fine line between appealing to users and pandering to traditional gender roles. 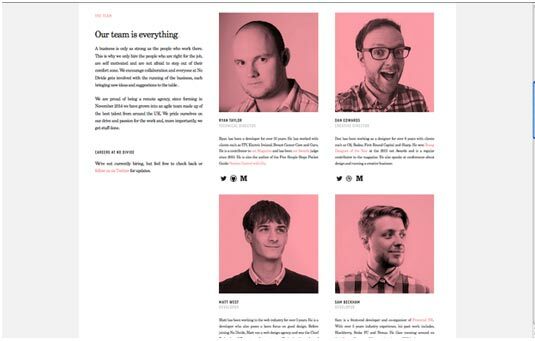 While not exactly manly, the site for No Divide Studio shows off its quirky youthfulness and playfulness with the pink flourishes throughout, including the filters on their team pictures. The site clearly shows that dashes of pink create a fun and unique vibe, so don't be afraid to be unorthodox. While not a popular choice in web design, brown can, under the right circumstances, be effective nonetheless. As the colour associated with the earth and trees, brown can add an outdoorsy feel, maximized by a pairing with green. The tree connotations also give a sturdy and reliable feeling. In web design, brown is most often used in conjunction with wood texturing, giving the same old-fashioned and rustic atmosphere of a wooden cabin. 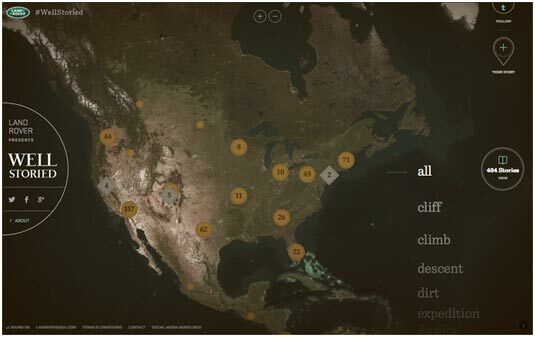 The brown filter and buttons suit the rugged and outdoorsy theme of Land Rover's Well Storied site. As the strongest of all colours, black is often used only sparingly – such as for text – but it works quite well as a primary colour element (like for backgrounds). Much like purple, it adds an air of sophistication and elegance, and also mystery, though with much bolder confidence. 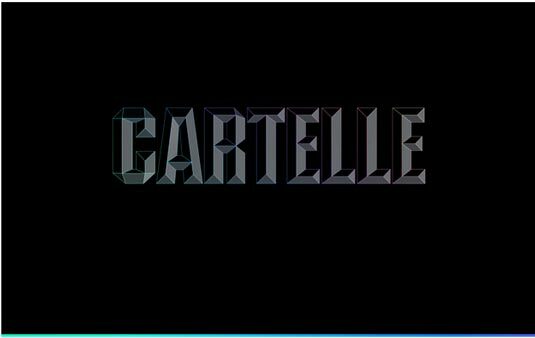 The heavy use of black for the Cartelle creative agency might even be scary if not strategically softened by the rainbow outlines along the letters (and the bright colour bases on the other pages of the site). Literally the opposite of black, white pairs well with just about anything, making it ideal as a secondary colour. In a supporting role, white draws out the elements of more stimulating colours, and can even guide your user's attention if you know how to use it (check out Zen of White Space in Web UI Design to learn more). As a primary colour, though, white gives off an impression that is both clean and chaste. Almost sterile, white has that “spotless” feeling that, for the right site, feels completely effortless. Its association with “good” and “holiness” give it a virtuous and pious feeling as well, while its association with hospitals and medical staff give it a healthy feeling. However, sometimes this sterile effect is too strong, even to the point of distraction, which counters its primary purpose. In these situations, an ivory or cream works better. These offshoots of white are softer and even less noticeable, but with the same minimalistic and complementary aspects. They are the more comforting and less stark alternatives to white. 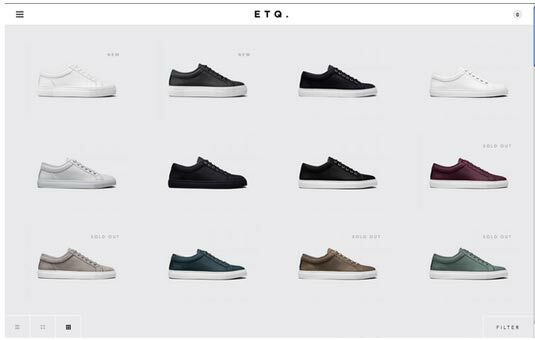 The shoe company ETQ uses a dominant off-white background to keep the users' attention where it belongs: the shoes. As the intermediary between black and white, gray exudes neutrality, or a lack of any particular sensation. However, in the hands of an expert, this intermediary position can be a powerful tool. By varying the vibrancy, gray takes on the properties of either black or white – attention grabbing or repelling – to specific degrees. That means if black is too powerful for your design, try dark gray. If white is too bland, try light gray. On its own, though, gray is rich with individual characteristics. It is the colour of formality, and so sites aiming to look traditional or professional tend to favor it. It can also give a depressing vibe, as it's the colour of gloomy and rainy days. When used dominantly, it can be somewhat subduing, for better or worse. 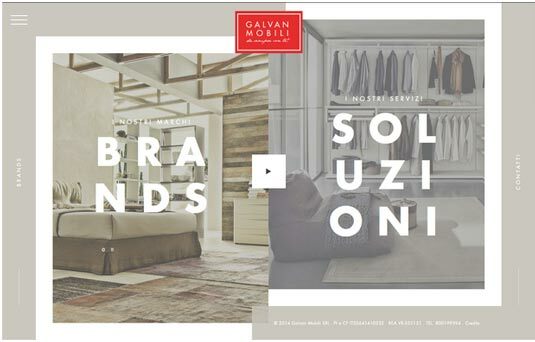 You can tell the Italian furniture company Galvan Mobili uses gray well because you don't even notice it. The gray background gives a professional air, and keeps attention on the pictures and bright red logo. Beige may not be a primary colour, but it's worth mentioning because of its accentuating effects: it takes on the characteristics of the colours around it. While dull on its own, its enhancing effects make it a powerful choice as a background or secondary colour. 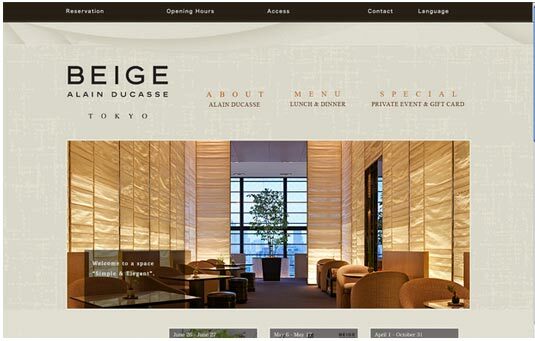 The use of beige for the aptly named Tokyo restaurant Beige Alain Ducasse creates a calming, comfortable backdrop to the more relevant elements like clickable text and photos. 03 July makes excellent use of the emotional connection of different backgrounds. While scrolling through the product features, the background colour changes to suit the description. 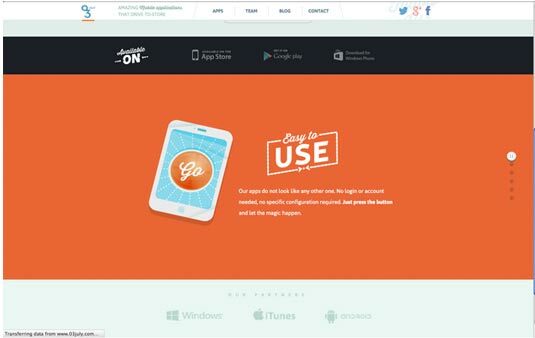 In the above example, the playfulness of the orange-red background certainly complements the “Easy to USE” headline.